I learned a new phrase yesterday. I have been subbing in the Pre-K class this week as an aide and am learning more about Handwriting Without Tears(HWT). Yesterday was a number day, the children are working on the numeral/number 7. The teacher had the children use the wet, dry, try method to help learn it's formation and writing it. Wet, dry, try--try saying that five times fast. Here is how it works. The teacher first presented the numeral 7 by using the blocks, one little line and one big line. 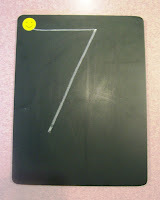 Then they each got a chalkboard with the numeral 7 drawn on it. If you take notice the chalkboard has the happy face I talked about earlier, in the upper left hand corner. 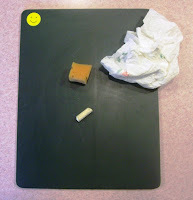 These chalkboards are not from HWT, we bought them elsewhere and added our own happy faces. They are also larger than the chalkboards you would get from HWT. Our boards are actually 9 x 12. After all the children had their board with 7 written on it, she gave them a small wet sponge. They were supposed to "write" the 7 with the wet sponge, in turn erasing it. 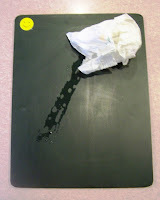 Then they took a paper towel and dried the wet line they made. 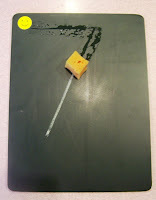 When the board was dried, they then drew the numeral 7 by themselves with a small piece of chalk. In turn--wet(sponge), dry(paper towel), try(writing with the chalk). Take notice(picture at top) to the size of the sponge and chalk the children used. Smaller items promote using the correct hand position for writing. 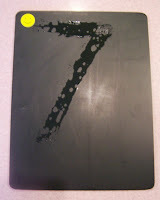 I thought this was a pretty neat way to introduce writing the 7, so I wanted to share it with you. It is done for all the numerals and the letters too. What a GREAT idea. Will definitely try this one. That is such a great idea. I have been trying to think of fun ways for my daughter to work on her handwriting skills. You probably know this as you follow, but I included this in today's post with a pic and link. Thanks for explaining it so well!